Attention visitors! My new assistant Minnie-May will direct you to her new corner of the site, where she will introduce you to this brand new section devoted to manga reviews. I've decided to devote an entire section to just reviews for animation that does not fall into the "anime" category that my site is all about. Why? Well, my assistant Demona is here to direct you to her little niche at this site. Click the blue box, and we'll show you a few reasons why I felt the need to make this section! Greetings, fellow anime fans! I have created this site for two reasons. 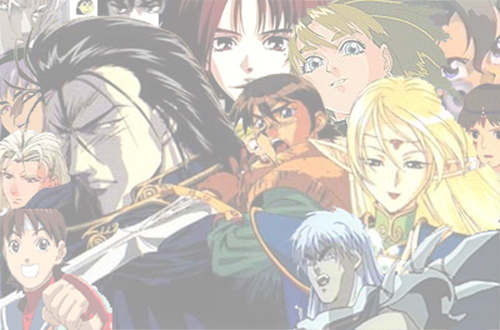 First, I made this site as a tribute to my favorite anime series/movies. Secondly, I made this site as a way to introduce other anime lovers to selections that they may have never experienced before. I hope you find the contents of this page interesting, informative, and most of all enjoyable. Feel free to send me your comments on this site and the contents herein. Send your e-mails to joshuab48@hotmail.com. I intend to add more reviews as my anime collection grows, so make sure you drop by now and then. Eventually, I would like to see reviews submitted by others, so please send me any anime reviews you would like to have featured on this site. There are a few criteria for your reviews, so please check under the Submit Reviews section. Also check the Site News section for information on new reviews, updates, and added features. This is our official mascot, Chibi-Ashram!!! The more times you see this little guy's noggin on the rating charts, the better the reviewed anime did in that category. Here is a handy-dandy link button you can use to link your site to mine! The webmaster had no part in the creation, ownership, or distribuition of the anime or cartoons featured on this site.This site is completely non-profit. The pictures featured on this site are largely borrowed from the archives of other anime pages, although I take credit for some of the pic modifications and the "Chibi-Ashram" artwork.